For many grassroots public education activists around the country 2017 has been jam packed with one challenge after another. We know how hard you’re working. Please continue to let us know what we can do to support you in your work. Our email addresses are at the bottom of every newsletter we send – don’t be afraid to use them. We want NPE’s Grassroots Education Network to be a resource you can lean on for both information (stay tuned for a soon to be published Toolkit on school privatization) and support. Don’t forget about our Facebook group – it’s a great way to make connections and ask advice. We need spaces where we can come together and share our successes and our struggles. 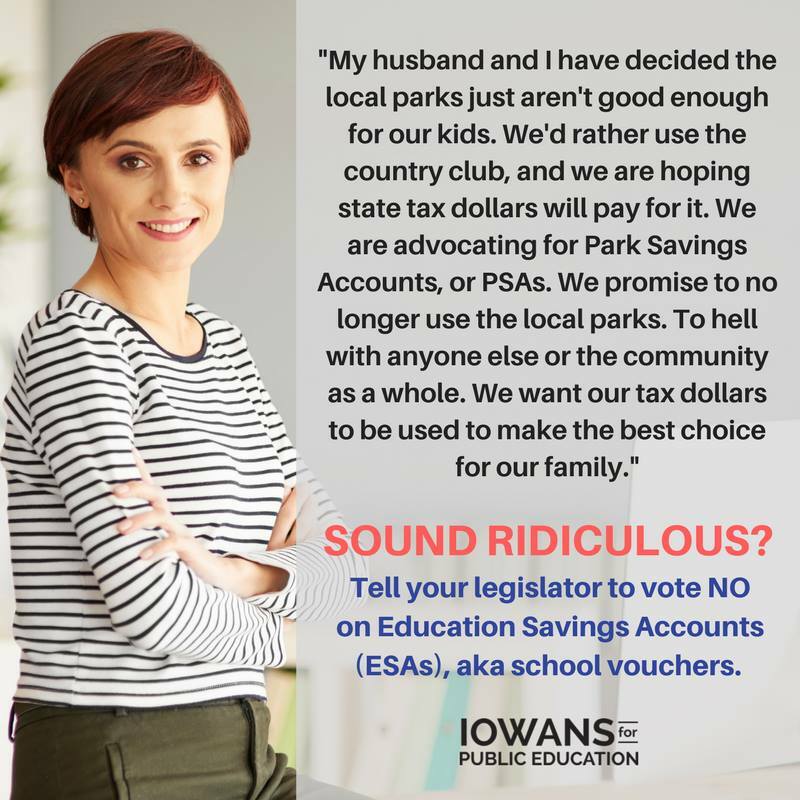 It was created by one of the newest groups to join NPE’s Network, Iowans for Public Education, just as they were starting to organize and push back against Iowa’s out of control legislature. The meme immediately launched them into the spotlight, and even got them a mention in the New York Times. You can learn more about the phenomenal work they’re doing in one of this month’s reports below. Tennessee’s own Momma Bears have been using their blog to chronicle the similarly out of control legislature in their state. Below you’ll find their post detailing Tennessee’s latest failed attempt to move a voucher bill. And Arizonans for Charter School Accountability was featured in the latest installment of NPE Executive Director Carol Burris’s charter school report on Valerie Strauss’s Answer Sheet blog in the Washington Post. Jim Hall of Arizonans for Charter School Accountability has shared a must read in-depth report on Arizona’s unaccountable charter school sector. Charters and vouchers may be dominating the news cycle thanks to the school choice policy push coming out of Washington D.C. and state legislatures, but testing issues are percolating to the surface as “testing season” officially begins across the country. Our national partner, FairTest, has shared a report on the latest facts you need to know to help launch a successful opt-out campaign in your state. You can find a link to this month’s reports here. Opt-out of testing for better public education! Our friends at FairTest make the argument that by educating and organizing toward clear testing reform goals, we can win. As ALEC targets Iowa and Americans for Prosperity sets up offices statewide, Iowans for Public Education know they’re in for a long and difficult fight. The most basic transparency is a simple accounting of where public dollars are spent. This transparency is sorely lacking in Arizona. Is there a grassroots group doing great work in your state that we’ve overlooked? Please invite them to join.